Following the 2016 move of Rotoflex's Canadian regional office to a larger, new 18,000 square ft. showroom and technology centre near Toronto, full production of new Rotoflex slitter/rewinders and die cutting machines, formerly managed at the Mark Andy headquarters location near St Louis, Missouri, has now transferred to Toronto as well. Continued sales growth over several years of Rotoflex's offline finishing solutions, including the newly launched HSI, Vericut3 and Security Series led to this expansion of the Canadian facility. Kevin Gourlay, vice president of Rotoflex, said: "The Rotoflex brand continues to be strongly focused on design and providing advanced solutions to respond to our customers' business. With many legacy design experts and technical specialists in Toronto, having our Canadian facility fully operational with manufacturing was a logical move." 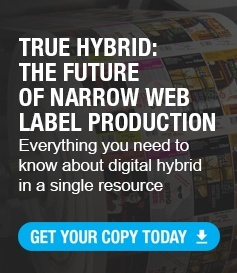 The manufacturing capacity at Mark Andy resulting from the move will accommodate the company's substantial growth in the digital market, supporting demand for their growing digital hybrid portfolio including the award-winning production-level Digital Series, entry-level solution Digital One, and the Digital Plus program which offers digital retrofits to existing flexo platforms. "Rotoflex is now well-positioned for future growth," concluded Gourlay. Click here to request a demonstration at one of our global facilities.